CraigX provided us with photos from this past weekend's Wonders of Cannabis Festival. Craig has a recurring role on Showtime's, Weeds. Both he and Chong spoke at the event. During interviews, Tommy kept the anti-Cheech sentiment to a mininum, but there was the occasional jab. Tommy said that he is going to be more active in the pot movement and that his wife, Shelby, encouraged him to participate in this festival. On Nov 1, CBS Channel 2 anchorman Mario Bosquez will make a guest appearance in Latinologues . He will play a Latin soap star. Bosquez's appearance will be filmed for an upcoming segment on CBS' "Morning News" program in November. Parade magazine wants you to vote for the best all-time comedy team. Vote for Cheech and Chong! If they win, maybe this will make them reconsider the reunion. Tommy is returning for the eighth and final season of Fox's That 70s Show. He's now part of a new opening credits song. CBS News posted a video interview with Cheech Marin and the cast of Latinologues on their web site. When asked about comedy during the 70s, Cheech said "Laughter was much better back then. It was cheaper! We've come a long way The audience is much more intelligent. I'm much more comfortable being out on the edge than being the center of the mainstream". Meanwhile, Hispanic Business Magazine named Rick Najera one of the most influential latinos in America. Brett Alexander (comedian, actor, musician, creator of the Cheech and Chong signature guitar series) provided us with photos from Harvest Fest. It was a lot of fun even in the rain. The Cheech and Chong bots looked great. His friend, Pete, is on guitar. Tonight, we went to the opening night of Latinologues , the Broadway play Cheech is directing. It was much better (we didn't think it could get any better) than the preview we went to a few weeks ago. There was more improv and new jokes. We laughed our asses off. People were laughing so hard that they couldn't catch their breath. The actors kept having to take long pauses, waiting for everyone to settle down. The aftershow party at Havana (46th, betw 6th & 7th) had numerous models and celebs which we could not identify. Check out the footage below and let us know who these people are. We sat at a table with Latinologues writer Rick Najera, Cheech, what we think was Cheech's girlfriend, Geraldo and Geraldo's wife. Rick Najera is a super nice guy. He's the type of guy you'd go to a bar and drink beers with. I asked Cheech about his current projects, but once again did not want to discuss the termination of the C & C reunion. Cheech Marin is a humble individual, appreciative of everything in his life. All he would say was that "tommy is a unique individual". 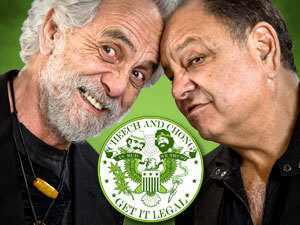 We genuinely think Cheech Marin and Tommy Chong really wanted to do the movie, but things just didn't work out. Cheech doesn't have anything bad to say about anyone. We asked Cheech about Senor Dracula, a Spanish version of the film Dracula which he is directing. The film is still being written. Efren Ramirez, the actor that played Pedro in Napoleon Dynamite, appears in the film. While we were there, we spoke to Cheech about a top secret project we here at Cheech and Chong Dot Com are working on. He was very interested. In mid-November, we will make a formal announcement. There will be tons of fanfare and we think all Cheech and Chong fans will love it. Other celeb sightings...Rosie Perez. She looks great. Random video from aftershow party which shows the ambience. Over the next few days, we'll be posting articles and interviews regarding this Thursday's Broadway opening of Latinologues . The show is fantastic. Purchase tickets for Thursday's star-studded opening here. Apparently, the FBI has a policy which prevents them from hiring certain people that have previously used drugs. AP interviewed Tommy Chong regarding this policy. "I don't think you could find anybody who hasn't tried marijuana, and I take a lot of credit for that," said Tommy Chong, the comedian whose films with Cheech Marin provided over-the-top portrayals of marijuana culture during the 1980s. "They're going to have to change their policy." Update: This article and Tommy's quote has appeared in nearly every newspaper around the world. During a phone interview with the Mercury News, Tommy Chong provided some additional information regarding the end of plans for a Cheech and Chong reunion. In recent weeks, Cheech Marin and Tommy Chong have been attacking each other in the media. From what we can gather, Cheech feels they're too old to reunite as hippy stoners. This is one of the reasons he backed out. On the other hand, Chong feels that Cheech considers himself an "actor" "above the comedy." He feels that Cheech is a sellout for forgetting about his comedic past. Cheech Marin and Tommy Chong made some of the best comedic films of all time. They're legendary and the duo could easily pick up where they left off. Age will not be an issue. They should keep working on a script until they're both happy with it. Chong says he's tried to call Cheech, but Cheech hasn't returned his calls. This is not surprising. Chong began a smear campaign shortly before the opening of Latinologues. Chong's comments were tasteless and unprofessional. Tommy also revealed he has completed work on his book, The I Chong, which details his stint in prison. Chong says he's spent $1 million on legal fees thus far and expects to spend another mill trying to reverse the conviction. As mentioned in our previous article, the Cheech Marin-directed play, Latinologues, was flawless on it's first night of previews. As a result, they have moved up the opening night to Thursday, October 13th. It's only running for 12 weeks so DO NOT MISS IT. The play is hysterical.